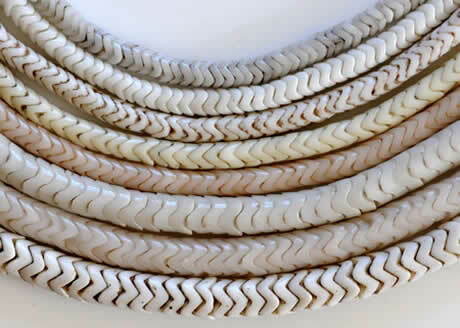 Various snake beads in the white range. All are type A. Rows 1 and 2: from Risler or Redlhammer/Preciosa with three points, size: 6 x 3 to 6 x 4mm. Rows 3, 4 and 5: from Bapterosses with three points, size: 6 x 5mm. Row 6: from Risler or Redlhammer/Preciosa with four points, size: 9 x 5mm. Row 7: from Bapterosses with four points, size: 9 x 6mm. Row 8: from Risler with four points, size: 10 x 6mm.